LOCATION.--Lat 44°13'21", long 75°04'28" referenced to North American Datum of 1983, St. Lawrence County, NY, Hydrologic Unit 04150302, on left bank 300 ft downstream from powerplant, and 2.8 mi north of Oswegatchie. PERIOD OF RECORD.--October 1924 to September 1968, annual maximum only--1985, July 1987 to current year. Prior to October 1958, published as East Branch Oswegatchie River near Oswegatchie. REVISIONS HISTORY.--WDR NY-88-1: Drainage area. GAGE.--Water-stage recorder and crest-stage gage. 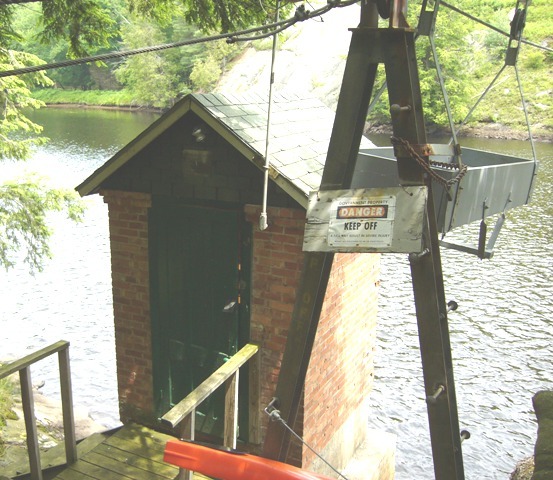 Datum of gage is 1,016.52 ft above NGVD of 1929 and 1,016.12 ft above NAVD of 1988 (VERTCON). REMARKS.--Extensive diurnal fluctuation at low and medium flow caused by powerplant. Entire flow from 140 mi² of drainage area controlled by Cranberry Lake (station 04260990). EXTREMES FOR PERIOD OF RECORD.--Maximum discharge, 4,370 ft³/s, Apr. 15, 2014, gage height, 6.45 ft; maximum gage height, 7.3 ft, Apr. 26, 1926; minimum discharge not determined.